Are these listed anywhere, published officially or fan listed? In particular I would like it if it had the source reference as most of these you would want to read about Thaur for example before taking it. I know there are the Character Creation supplements but they don't contain this information. Not that I've seen, but if you make one feel free to post it here. It'd be pretty useless if they had made that list because there'd have been less incentive to buy the supplements in the first place. As for the Home World alternates these are all I could find in the books. Wooh, that was a lot. As far as I know that's all the character creation opens, unless there are alternate backgrounds or something I'm forgetting. Beyond those listed in the imgur (excluding the Elite Advance: Astropath and Elite Advance: Sister of Battle)? I wrote up every source of aptitudes, let me know if I'm missing a source. Interesting how rare some stuff is. Notably 8 talents have only a single talent, these are almost always Tier 3 and Willpower. Could someone let me know if there is another source of talents I'm missing, I've got the Talent chapter from DH, EW, EWo, EB. And the 4 Elite Advances that give talents (Astropath, Inquisitor, Sister of Battle and Untouchable). That's every talent in the game right? I've had this for a while now! Hopefully it helps you out. Should have the Roles tab done soon. Very useful alemander, didn't even know there was such a PDF. The only thing I would recommend it is sticking a source column on somewhere since it's useful to be able to read the flavour. Your +/- table looks really good. I see you also lack Novabella from the bg table. Happy to help with roles, especially since I wrote up the roles and aptitudes already. I see you also lack Novabella from the bg table. Do I? It's under Agri-World! 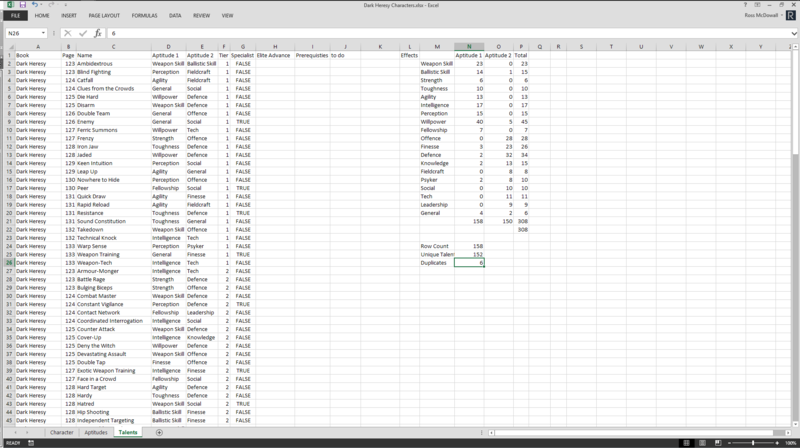 Any idea how I can enable overlapping of text/data for cells? I'd have it on E20-E56 but C27 gets overridden. I can make the cells bigger if not but it seems a big excessive. 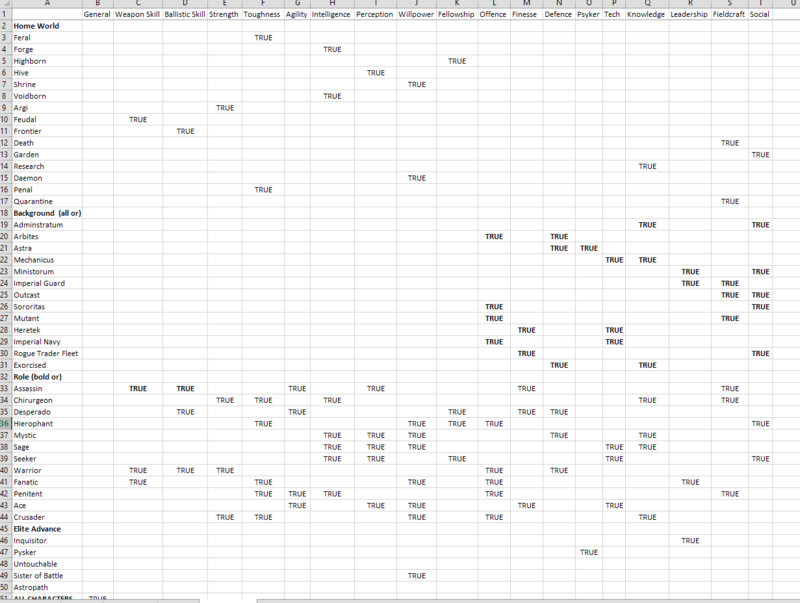 Also no idea I use excel and overlapping is default. Whenever it breaks I just copypaste the text into another cell values only and then copypaste it back with the fixed formatting. Maybe just set the cell alignment to the far right? You could also stick it in AA row instead. Quarantine World you've got as Int and Per but in the book it's BS and Per, and - Strength. This was a good find. Thanks, all.